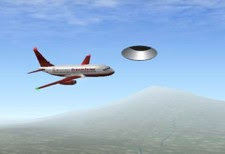 The crew of a Boeing 737-200 reported the presence of an unidentified flying object during descent maneuvers at Mexico City International Airport (MCIA). The incident occurred last Monday, October 27, at 9:00 p.m.
frontal diameter was some 8 meters, roughly that of the airliner's cabin. The airliner was flying the Los Cabos-Mexico City route. There was good visibility and clear skies.